The speedy and long-lasting Samsung Galaxy Tab S has a brilliant display made for video and games, yet it also has impressive productivity features, making it the best 10-inch Android tablet. Large-screen Android tablets don't get as much love as the smaller ones do these days, perhaps because there aren't as many good ones to choose from. Compared to the multitude of enticing 7-to-8-inch models, there’s only a handful of impressive 9-to-10-inch slates. So what makes for an impressive tablet? We look for ones that have crisp screens with 1080p (or better) resolution, bright color palettes, interfaces that are pleasing to look at and easy to use, speedy and power-efficient quad-core CPUs, and designs that are thin and light—without feeling flimsy and cheap. The best of these tablets come at a premium, around $500. For that price, you want a device that offers extras—multi-tasking and kid-friendly modes and a wide array of content options—on top of all the basic criteria. Free stuff doesn't hurt, either. Of these four, one stands out clearly above the rest: the Samsung Galaxy Tab S. The speedy and long-lasting tablet has a brilliant display made for video and games, yet it also has productivity features that will serve students and road warriors well. The display on the Galaxy Tab S is the tablet's standout feature. It's largely what made us pick this one over the other contenders, including the Xperia Tablet Z2, which is equally thin, light and powerful. The Xperia's screen is beautiful, for certain, but against the Tab S it literally pales in comparison. Samsung's Super AMOLED screen technology makes for truly dark blacks and colors that pop. These vivid colors might not be exactly true-to-life, but the result is so pleasing to the eye that you'll be too busy enjoying it to care whether the reds look just a tad too red. The 2560 x 1600 resolution provides a dense 287 pixels per inch (ppi), which is perfect for viewing any type of content. High-pixel-density displays are ideal for reading, because fonts remain crisp even at small sizes. You can read digital magazines in full layout mode, without zooming in or switching to text-only mode. Every pixel in full HD movies is visible, so you won't miss any detail. The same goes for games and pictures. The screen looks just as good whether you're holding it close or set a few feet away, looking at it straight on or at an angle, which makes it a clear winner for watching media. The Xperia Z2's 10.1-inch display has a lower-density, 1920 x 1200 resolution, which in and of itself doesn't mean an unsatisfactory viewing experience (it also boasts wide viewing angles). But the lack of vibrancy when compared to the Tab S pushes this tablet to second place. The Kindle Fire HDX has a smaller display than the Tab S (8.9-inches), but since it has the same resolution it's more pixel dense—339 ppi. Amazon touts this as one reason why the HDX is a great choice for media consumption. But while the Tab S has a technically less dense display, it’s still better for viewing video thanks to its larger 10.5-inch screen. Samsung's own content offerings aren't as comprehensive as Amazon's, but they don't need to be. The Tab S has access to all of the music, movies, TV shows, books, and magazines available on Google Play and multiple other content sources (including Amazon in the near future). Plus, Tab S owners can enjoy a free three-month subscription to Marvel Unlimited for comics, some free trial magazines in Samsung's PaperGarden (which are as beautiful as any iPad magazine I've seen), and Milk Music, a streaming service powered by Slacker. Milk Music is available only to select Galaxy tablets, and its best features—offline listening, unlimited skips, and a sleep timer—are limited to the Premium tier ($3.99 per month). Still, the free version is better than Pandora or Spotify's free services in many ways; for instance, you can play any song in the catalog on demand and don't have to deal with ads. Another content-viewing benefit: The Tab S is a great companion when watching TV on a real TV, because it can double as a remote control and personalized programming guide. Big tablets often stay in the house, because they're not as easy to hold and carry as their 7– and 8-inch counterparts. So a 10-incher doesn't need to be super-slim and light to be a great tablet, but we'll admit that it does help. At just over 0.25 inches thick and 1.025 pounds, the Galaxy Tab S is among the lightest and thinnest tablets on any platform, rivaling even the iPad Air. And, unlike the Xperia Tablet Z2, which flexes far too easily under small amounts of pressure, the Tab S feels sturdy and solid. Its light weight makes it possible to play games, watch video, or flip through magazines without feeling an ache in your wrist after less than an hour. Toting it in a backpack or small bag is no big deal, either. Though the design language for the Tab S is clearly modeled after the Galaxy S5 smartphone, the tablet lacks its smaller cousin’s water-resistant design elements—one place where the Xperia bests the Tab S in the design department. You can run Sony's tablet under a faucet if it gets a bit dirty in the kitchen or read in the tub without worrying about ruining it. Samsung opted for narrow bezels around the display and physical buttons for Home, Back, and Recent apps, just as on the company's phones. The bezels don't leave much room for resting thumbs and the buttons can get in the way when holding the tablet in portrait orientation. The Xperia Tablet Z2, by comparison, has much wider bezels and on-screen navigation controls, which eliminate both problems. Still, I prefer the look of the Tab S over the Z2, and would rather have physical buttons than not. The Galaxy Tab S runs Android KitKat 4.4 with Samsung's TouchWiz skin. The user interface is far simpler and refined than in previous generations, matching the on-screen look of the Galaxy S5. This version of TouchWiz looks (and sometimes acts) differently from basic/stock Android in service of making the OS intuitive and efficient. Oft-used settings and features are only a tap or swipe away in most cases. In addition to the familiar Android homescreen, TouchWiz also includes an alternative set of homescreens that show your schedule, emails, news, and other information in a magazine-like layout. Switching between the two homescreen environments is as easy as swiping left or right—and you don't have to switch back and forth, if you don't want. Deeper down, TouchWiz is chock-full of features and goodies: Multi-user sign on lets everyone in the family have their own apps, settings, and data; fingerprint scan sign on removes the need for a passcode; a Kids Mode walled garden allows parents to confidently hand the Tab off to a child; S Finder search scans everything from emails to apps to documents in one go; and S Voice controls the Tab via voice commands. We realize that heavily customized skins aren't to everyone's taste, but there aren't many choices among large-screen tablets without them—especially none that come close to our top pick. Amazon's interface for the Fire line is so different from stock Android that it feels like a another beast entirely (it's simple to use, just limited in functionality). Sony's skin is just as involved as TouchWiz, and also includes functionality not found in stock Android. The Small Apps multi-tasking feature, for one, gives owners the ability to use simple apps, such as the calculator, notepad, and browser in mini windows that float over the homescreen or primary app in use. This is cool, just not as useful as what Samsung provides. Even with all of the TouchWiz features and flash, the Galaxy Tab S remains speedy and its performance is smooth. It has a powerful 8-core processor and 3GB of RAM, the same as the Xperia Z2 and most other large or high-end Android tablets. RAM is important here to power the Tab S’s multitasking feature, Multi Window. Users can place two apps (or, in some cases, two instances of the same app) side-by-side, switch between them quickly, and drag and drop info from one to the other. In my testing, I didn't notice any performance lag using Multi Window—or in regular single-app mode, for that matter. Even with a powerful CPU and a large and brilliant screen, battery life doesn’t suffer. The display technology deserves part of the credit here (AMOLED is designed not to drain power) and software tweaks take the rest. (A large, 7,900mAh battery helps a lot, as well.) The Tab S consistently lasted me a full day with heavy use and brightness set to Auto. Tests run by Android Central, PCMag, and Laptop Magazine all got similar results. You'll still have to plug the tablet in every night to charge, but it shouldn't die in the middle of a long car trip—even if you watch video the whole time. Android isn't as good of a platform for productivity as Windows 8.1 is, but with the right add-ons and software, you can get real work done on a 10-inch slate. Most people who want a tablet for this purpose are immediately drawn to models like the ASUS Transformer Pad TF103C, which has a detachable keyboard dock (included in its $299 price) that makes the tablet feel more like a laptop. However, at that price, you’ll get neither a high-pixel-density display nor as much power under the hood as on the Samsung or Sony. Battery life on the Transformer Pad is also a disappointing 4.5 to 5.5 hours. The clear advantage of the Transformer Pad's system is that its keyboard connects physically instead of over Bluetooth. That's a boon for very fast typists, since Bluetooth keyboards can lag behind key presses (though this is less of a problem now than it was a year ago). Unfortunately, the keys are a little too cramped for a keyboard this size. 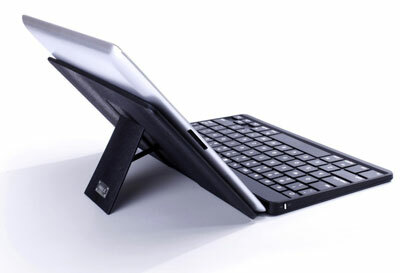 The Transformer's keyboard dock has a built-in touchpad that is poorly designed for Android use. Due to the position, it's very easy to brush the touch surface and make the cursor or the whole screen jump. The right-click function takes up a lot of space even though many apps won't recognize a right click. In the end, you're better off just using the touchscreen. Given all that, the Galaxy Tab S is still the best pick if productivity is a high priority. You can pair it with almost any Bluetooth keyboard, so you can find one with a layout that works for you. The best one I've used is the iWalk Executive ($59.99 on Amazon). But if you want one that matches the style and size of the Tab S, Samsung makes one that doubles as a cover and has a notch that sits the tablet up laptop style. The Tab also has several software-based multi-tasking and productivity features on top of the aforementioned Multi Window: SideSync lets users access the data, apps, and calls from their Galaxy phones; and Remote PC lets them tap into files and programs on their PCs. Cameras are never a standout feature on any of the best large screen tablets, but the Tab S is just as good or better than the competition. It has both rear– and front-facing cameras that are decent, but not impressive. Of the top competition, it easily bests the Transformer Pad, whose cameras have less megapixels and barely any software support to improve quality. The 8MP camera on the back of the Tab S takes okay pictures in good light, just like the Xperia Z2 and the Fire HDX. But in low light, its images have a lot of noise. The Tab's camera is detailed enough to take images of printed text that can be translated into editable text by software that uses OCR (optical character recognition). Students will find this useful in particular. They can also use the Tab S to capture whiteboards and projected slides with an app like YouCam Snap. The 2.1MP front-facing camera accurately renders skin tones and other colors during video chats. 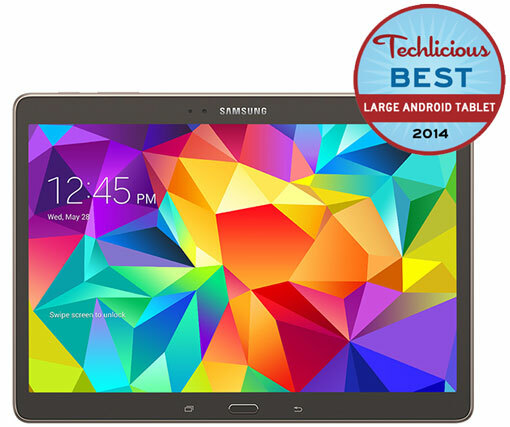 The Galaxy Tab S quickly collected rave reviews from major tech sites when it was released last month. PCMag hailed it as "the best Android tablet around right now" and praised the "classy" design. CNET agrees: "The Super AMOLED screen and sleek design are undeniably the Galaxy Tab S's biggest selling point," which makes the Tab the site’s "top Android choice for an entertainment slate." Android Central was no less effusive in their praise of the design and display. They also gave props to TouchWiz and this iteration of the Magazine UI: "It feels so right as a gateway to your content on a tablet, and the fact that it has a beautiful high-resolution user interface, on a beautiful screen makes it even better." AnandTech says that the Tab S 10.5 and its smaller 8.4-inch sibling are "easily the most compelling tablet family Samsung has ever released." And Laptop Magazine sums things up well in its bottom line: "Whether you like to watch a lot of video on your tablet or you enjoy looking through everyone's Facebook photos, the Galaxy Tab S 10.5 gives you a pretty awesome canvas in a very slim and light design." Though it's only been out a short time, the Tab S already has many 4 and 5 star user reviews on Amazon. Just like the pros, Amazon reviewers love how thin and light the Tab S is and praise the quality of the display. People who switched from an iPad report only one regret: the dearth of great Android tablet apps compared to iOS. Samsung hits all the right notes with the Galaxy Tab S, more than justifying its premium price tag. The display alone makes it stand above other Android tablets, and it has all the other qualities I look for in a large tablet: attractive, sturdy design, light weight, intuitive software, and smooth performance. And it's just as useful for getting work done as it is for settling in to watch a movie or read a magazine. 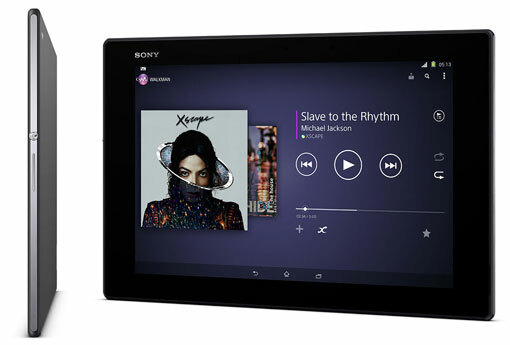 The $499 Sony Xperia Tablet Z2 is the next generation of last year's pick for best tablet, the Xperia Z. The Z2 has all the qualities that made its predecessor great: incredibly thin and light design, beautiful and wide-angle display, and water resistance up to five feet. Sony didn't mess around with the outer design much (a good thing), opting instead to concentrate on upgrading the internals. Laptop Magazine calls the Z2 "a great piece of hardware" with a "wonderfully light and thin chassis" that makes it "a pleasure to hold." In many ways the Xperia Z2 is equal to the Tab S. But its 1920 x 1200 resolution isn't as crisp, and, although the Triluminous display (same as found on Sony TVs) looks great, it still can't compete with Samsung's brilliance and pop. The biggest reason to choose the Z2 over the Tab S would be its water resistance, which can protect it from many common mishaps. Got gunk on the screen while cooking? Have little hands, which often are not clean hands, been using it? All you have to do is run it under the tap to wash it off. The Sony Xperia Tablet Z2 is an excellent choice if that level of protection is a must in your house.